• St. Mark’s-in-the-Valley moved to Los Olivos from Solvang prompted by a gift of land from The Hon. Leonard Firestone. His son, Brooks Firestone, chaired the building committee. 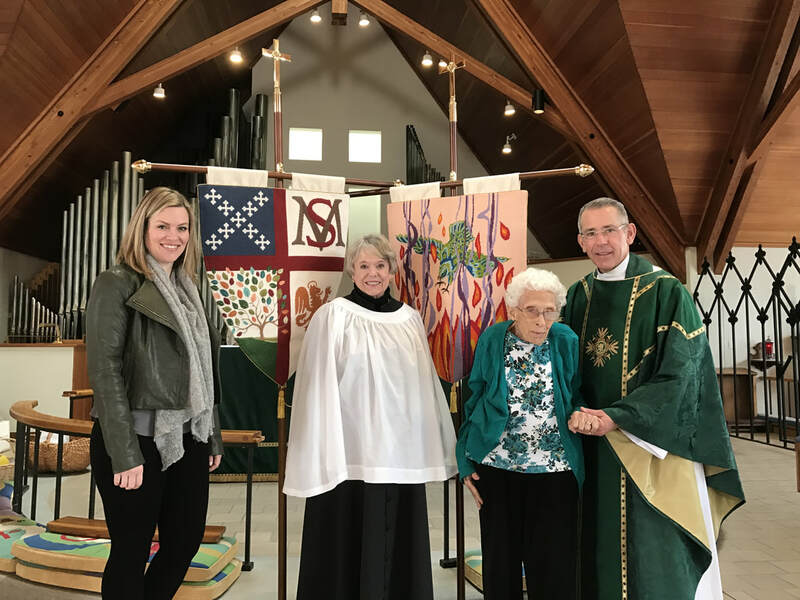 The parish as a whole undertook the monumental effort of building all three buildings on the campus debt-free through their donations and engaging in a series of creative, time and labor intensive, large-scale fundraising events. 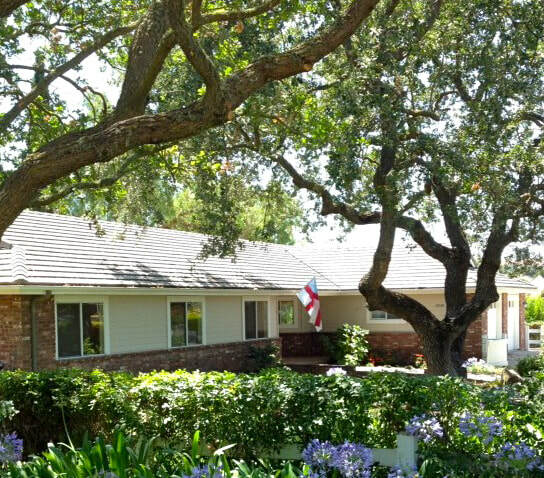 • St. Mark’s also owns a rectory (clergy house) on Alta Street in Los Olivos, acquired debt-free in 2012. The Rusack-Firestone Rectory is named for The Rt. Rev. Robert A. Rusack, late Bishop of Los Angeles and Ambassador Leonard Firestone. Both men were instrumental in the move of St. Mark’s from Solvang to Los Olivos and their families are still active in the parish. 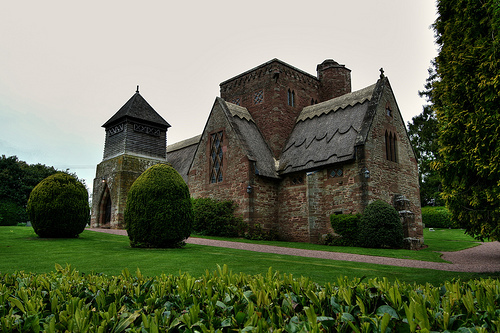 • All Saints’ Church, Brockhampton, near Hereford, England, inspired the design of the church buildings. That building was the last major work by architect William Lethaby, a leading light in the Central School of Arts and Crafts in London. All Saints’ has been described as one of the most important buildings of the early 20th century. 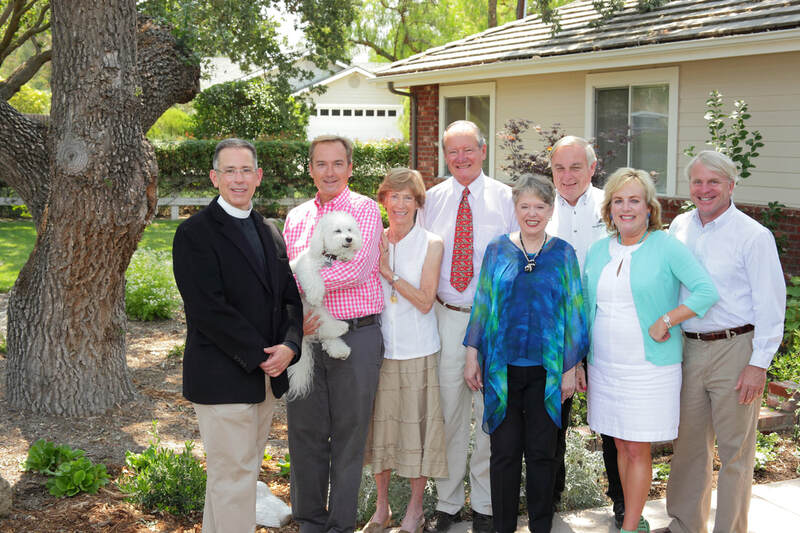 • The architect of St. Mark’s-in-the-Valley is the noted California architect Richard A. Barrett, A.I.A. The Arts and Crafts reflection of the Gothic style is clearly seen in the buildings, adapted to the local setting and contemporary era. • The extended dormers which rise from the ground are a good example of Mr. Barrett’s blending of the style to serve as sun shades while allowing ample light to enter the church. • The pitch of the ceiling and cross members is reminiscent of the Brockhampton church. The floor plan is a traditional cruciform with the main altar at the cross. The wood in the ceiling is long grain fir. • Font The font was a gift from Brooks and Catherine Boulton Firestone. It was originally in a Church of England church in Warwick Crescent in northwest London. The church was being demolished because it was deteriorating and to make room for a new church. The font is sandstone and approximately 180 years old. • Altar The high altar was designed by The Rt. Rev. Robert A. Rusack, Bishop of Los Angeles and given by him and Mrs. Rusack in memory of The Rev. William Scott Chalmers, for whom the chapel is also a memorial. • Pulpit The pulpit was designed by the architect and built by local wood craftsman Bud Tullis. • Chapel The chapel is dedicated to St. Columba in memory of The Rev. William Scott Chalmers. The altar and retable (mounted ledge inscribed Holy Holy Holy) are from the Solvang church. The chapel kneelers express Crucifixion and Resurrection as well as symbols of Christ and the Church. Symbols on the kneelers also represent Santa Ynez (St. Agnes), St. Columba, and the Jewish roots of Christianity in the Jesse Tree. The candlesticks and crucifix were carved by The Rev. Paul Linaweaver, a former Navy chaplain who retired in Santa Maria. Bud Tullis built the tabernacle for the reserved sacrament, which was given in memory of Albert D. Etchelecu. • The Tower and Bell The bell is “Gordon’s Bell” and is a memorial to Gordon Thomas Jones, a member of St. Mark’s who died at age 19 of Hodgkins’s disease after a gallant, five-year struggle. The bell is tuned to the musical note “A” and weighs 1,010 pounds with an outside diameter of 35 inches. It is 78% copper and 22% tin and was cast at the Paccard Bellfoundary, Annecy-le-Vieux, France. • The belfry is a memorial to Vincent and Margery Evans and their daughter Venetia who died in an airplane accident five miles from Los Olivos. • Organ The organ has 22 ranks and more than 1,000 pipes ranging in size from 16 feet to 4 inches. It was custom built for this space by the Schoenstein Company of San Francisco. The voicing was done by Mr. Lawrence Schoenstein who, at one time, was the head voicer for the Skinner Organ Company. The organ was given in memory of Mr. and Mrs. Louis Winkler and Vincent, Margery, and Venetia Evans by their family. The backgrounds of the cushions symbolize our Valley in colors – purple mountains, golden hills, green meadows, blue river – with the white representing the Holy Spirit moving through our lives. Christian symbols combine with flora and fauna native to the Valley. • The Churchyard Memorial Garden was completed in 1981. An English style lychgate (traditional churchyard entry) was constructed then as well, located in the garden’s northeast corner. Inside the lychgate, memorial plaques honor loved ones whose ashes are sprinkled here or who are remembered but not buried here. • Stained Glass The upper windows in the Chapel were originally in the old church in Solvang and made by Judson Studios in Los Angeles. Designer Jean Meyers extended the net of the center window in the second row of upper windows into the four large windows below. In the upper window Jesus calls Peter to follow him and to fish for people. The round nave window, the lion and lamb, is taken from Isaiah, Chapter 11. Also, the lion is the symbol of St. Mark and the lamb is the symbol of Santa Ynez (St. Ines or Agnes). • Near the Memorial Garden, separated by a lattice of colorful rose bushes, is our walking labyrinth which is well trod by parishioners and visitors alike. • Banners: The St. Mark’s shield banner was designed by Elizabeth Bailey Witt and stitched by Catherine Pepe. The Phoenix banner (symbol of Easter) was designed by Mary Grigsby, M.F.A. and stitched by C. Lucille Hanna. • Carpet in the nave aisle and in the chapel was designed for the space by San Francisco interior designer Amy Weaver and fabricated by Stark of New Zealand wool; it incorporates stylized crosses and colors of the liturgical seasons and St. Mark’s buildings. 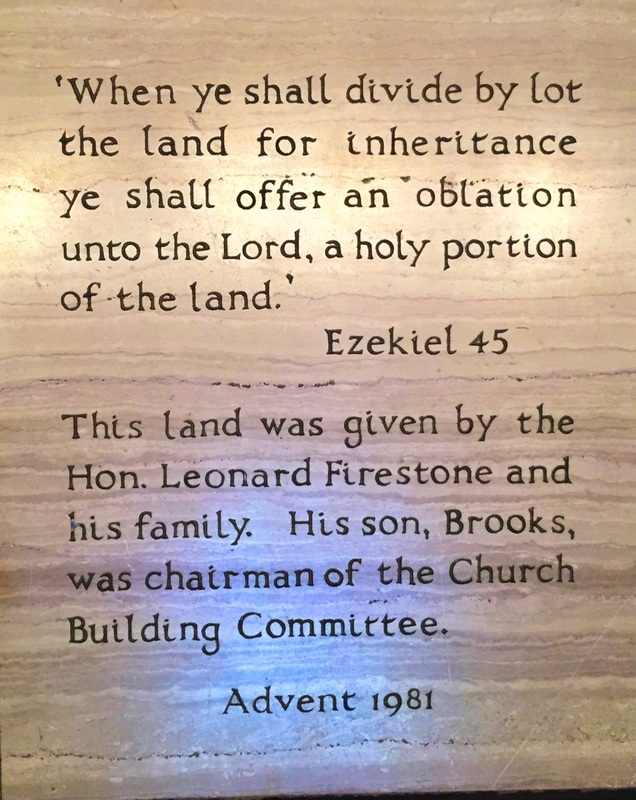 The carpet was given to the glory of God and in memory of his parents, Catherine and Emil Steck, Jr. by Fredric Steck. • Firestone Hall, Stacy Hall The buildings along the Courtyard are dedicated to the glory of God and in thanksgiving for the commitment of the Firestone Family to St. Mark’s and the Santa Ynez Valley and for the ministry of St. Mark’s second Rector, The Rev. Charles Herrick Stacy, who served for 32 years.